Like so many of his postwar generation, Peter Hennessy climbed the ladders of opportunity set up by the 1944 Education Act that were designed to craft a more meritocratic society. 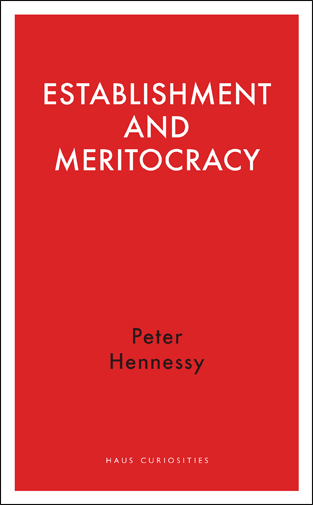 In this highly personal essay, Hennessy examines the rise of meritocracy as a concept, and the persistence of the shadowy notion of an establishment. He asks whether these elusive descriptors still have explanatory power in understanding British society and institutions, and why they continue to fascinate us. To what extent are they both imagined concepts? And, perhaps most difficult of all, did a British meritocracy rise in the years since 1945? Peter Hennessy is Attlee Professor of Contemporary British History at Queen Mary, University of London. He was educated at Marling School, Stroud; St John’s College, Cambridge; the London School of Economics and Harvard (where he was a Kennedy Scholar 1971–72). He spent 20 years in journalism with spells on The Times, the Financial Times and The Economist and as a presenter of the BBC Radio 4 Analysis programme. He is a Fellow of the British Academy and sits as an independent crossbench peer in the House of Lords as Lord Hennessy of Nympsfield.